Vasaloppet started in 1922, but really it is much older than that. The first Vasalopp was carried out as early as 1521 by Gustav Eriksson. During his flight from the Danish king he stopped in Sälen and returned to Mora to lead the uprising against the occupation forces. Gustav Eriksson eventually united the realm and became Sweden’s first king, better known under the name Gustav Vasa. In other words, Sälen is not only the starting point for the world’s largest exercise race; it is also the starting point for the history of our whole country. Vasaloppet’s history begins as early as 1520. Then Sweden was in a union with Denmark. Discontent with the Danish king was great, not least from Gustav Eriksson Vasa, whose opposition had resulted in his being imprisoned in Denmark. But the 24 year old Gustav managed to escape. After landing south of Kalmar in the spring of 1520 he began a long and dangerous march north. On his way, Gustav urged farmers and villagers to revolt against the Danish authorities, but to no avail. He then set his hopes on Dalarna, where the people were known to be tough and resolute, seldom giving way to decisions of authorities and kings. Gustav was hunted throughout Dalarna by the pursuing Danes, but the people sheltered and protected him from King Christian’s soldiers. After a month fleeing through Dalarna, Gustav stood outside the church in Mora and spoke to the crowd. Only weeks before, his father and his brother together with some 80 other magnates had been beheaded in “Stockholm’s bloodbath”. Gustav asked how long they could accept such atrocities and urged them to take up arms. But the people wanted to confer with the neighbouring villages before deciding on war. The Danes were in close pursuit and, before he could get the answer he wanted, Gustav was forced to take to his skis and continue his flight west towards Norway. A few days later news of King Christian’s brutal ravages throughout Sweden reached Mora, the people regretting then that they had not immediately supported Gustav. Mora’s two best skiers, Lars and Engelbrekt, sent in hot pursuit of the fugitive Gustav Vasa, caught up with him in Sälen. Gustav was persuaded to return with them to Mora to lead the fight against King Christian. In 1521, with the men from Dalarna at the head, Gustav began his battle. It took two and half years before the war was over and Sweden was a free land. On 6 June 1523 at a national assembly in Strängnäs, Gustav Eriksson Vasa was elected king of a free Sweden. 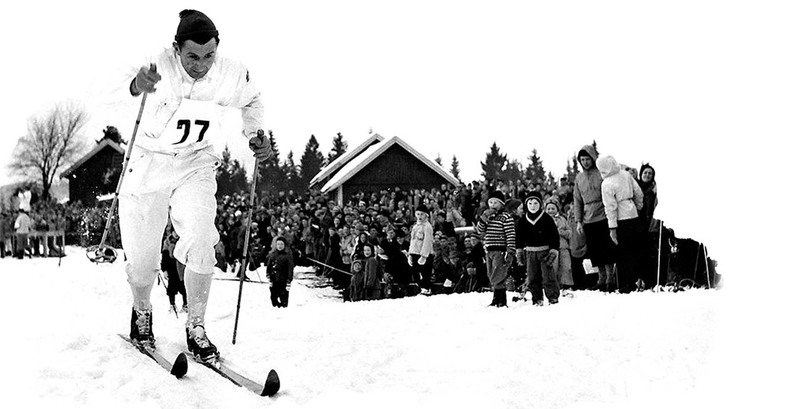 Now he is a symbol for the world’s biggest ski competition – Vasaloppet! Anders Pers, from Mora, is the father of Vasaloppet. It was from his thoughts that the world’s biggest ski race was born. He wrote about the contemporary interest in skiing and linked it to Gustav Eriksson Vasa’s flight on skis from Mora towards Norway in 1521. In an article in a local newspaper, Vestmanlands Läns Tidning, on 10th February 1922, he launched the idea of a Vasalopp. The national newspaper, Dagens Nyheter, reprinted his article the day after and, at the same time, gave its support for a long ski race, a test of endurance, as a commemoration of Gustav Vasa. After some considerable press debate, both for and against the idea, IFK Mora’s Board decided on 5th March to run a trial race, if there was some suitable financial backing. Dagens Nyheter donated 1,000 crowns to the arrangers and thus made it possible for the first Vasaloppet to be run on Sunday 19th March 1922. Carl Emmanuel Berg from Göta in Karlstad was the first to register for Vasaloppet, on March 10th. In total 136 registrations came in to the competition secretariat by telegraph and telephone. 119 skiers came to the start, among them some of the foremost in Sweden: Per-Erik “Särna” Hedlund, Strål Lars Eriksson, IFK Mora, Jonas Persson, Arbrå, and Oskar Lindberg from Norsjö in Västerbotten. At precisely 6.04 am, the race steward, Johan Westling, flagged the Vasalopps skiers off from Olnispagården on the west side of the river in Sälen. 7 hours 32 minutes and 49 seconds later the victor reached the goal in Mora after 90 kms skiing in sleet and snow. And it was Ernst Alm, from Norsjö IF, who won, five minutes before Oskar Lindberg, from the same club.